Before the lights go down, cast members amble on to the stage and take their seats facing the audience. As the overture begins, they inflict every crime inflicted by audiences worldwide, from answering a mobile phone to wrapping a noisy sweet-wrapper. At the same time, the tensions between the characters of Mozart’s opera begin to be laid bare, as Giovanni pushes Leporello aside to get his own hands up his neighbour’s skirt. Gerardo Garciacano, a charismatic performer and suave singer, portrays the Don as a man who appears to be willing his own destruction by the audacity and outrageousness of his deeds. His sidekick, meanwhile, played with real zest and crisply sung by Morgan Moody, is a man desperate to follow his master’s success with women but never succeeds – the very final image of the evening is of the remaining characters regaining their ‘theatre’ seats and Leporello once more trying his luck with Elvira with a surreptitious hand on the knee, to a fearful, warning stare from the other four remaining characters. 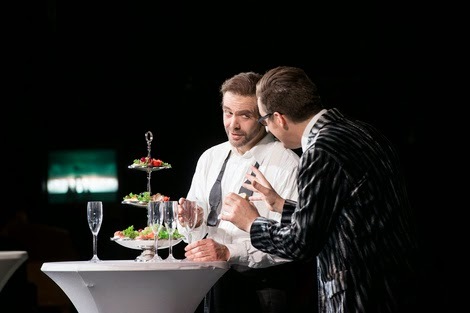 For his new production of Don Giovanni, Dortmund’s Intendant Jens-Daniel Herzog has stripped Mozart’s ‘dramma giocoso’ back to the essentials. There’s little in the way of scenery: in a striking reversal, the orchestra is placed behind a gauze on the stage and the raised pit area becomes the stage, with a ramp extending right up into the stalls. With little more than some red-plush chairs, party paraphernalia, two doors and spiral staircases for entrances and exits, and a few requisite props, the action is brought right in among the audience. The loss may be a slightly unconventional orchestra/singer balance, one that takes a little getting used to (the continuo takes a corner of the forestage), but the gains are immense in the immediacy of the dramatic performance. Otherwise, the staging is more effectively taut than simply conventional. Apart from a ghostly extra apparition of the Commendatore haunting Giovanni at the end of the Act I party scene and the climax in which instead of a vision of the fires of hell the six wronged avengers plunge knives into Giovanni’s back as he attempts to dispel Anna’s father’s ghost by emptying his urn of its ashes, the emphasis is more on tight portrayal and interaction of character than gratuitous intervention. There are some telling details of characterisation, such as Ottavio’s obvious discombobulation when the Don gives him a prolonged smacker on the lips to silence him – an act repeated in the final moments where Giovanni kisses each avenger in turn before they set upon him. This was a remarkably accomplished cast, almost entirely drawn from the Dortmund Theatre’s own ensemble. In fact one of the joys of revisiting companies like this is seeing singers one has admired in one production reappearing in another. Here the two leads from Paul Abraham’s jazz operetta Roxy und ihr Wunderteam, which I saw in December and which has only just completed its run, reappeared as Donna Elvira and Don Ottavio. Emily Newton, on secondment from the New York Met for the season, introduces Elvira in a cooler way than most, with her fury at her betrayal building through the drama and reflected in her vocal journey. Lucian Krasznec is an echt Mozartian tenor, lyrical and agile, and giving Ottavio a sense of poignant sympathy. Eleanore Marguerre’s Donna Anna had real bite – a focused voice with a clear but cutting edge. First-class singing from Sangmin Lee as Masetto, Julia Amos as Zerlina and Karl-Heinz Lehner as the Commendatore completed a true ensemble of a cast. 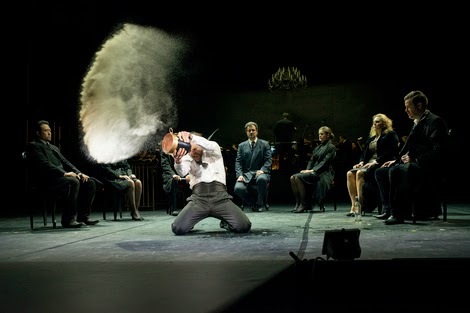 Interestingly, the last time I saw a staging in which the traditional positions of orchestra and stage were reversed was last summer in Calixto Beito’s production of Zimmermann’s Die Soldaten in Berlin, where the conductor was one Gabriel Feltz. Here he was again in the same theatrical setup – had he perhaps suggested it to the director, based on his experience there? 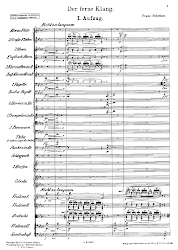 In this case, he had to strive harder to give the orchestra its rightful focus and yet he led a dramatic reading of Mozart’s score, particularly pointing up its instrumental contrasts and making the climax brassily towering.